Immersive 3D game. Every parkour move has the potential to modify the environment. Surfaces pop in and out of existence at will. March 27 Update: New gameplay video. April 3 Update: LEMMA IS GREENLIT! THANK YOU! Also check out the new demo build below! Lemma's main goal is to allow creativity through movement. I love games that let you create things, but am always frustrated by the blandness of the act of creation: you click in Minecraft and a block appears. In Lemma, you create things as you move through the space, through the ordinary movement mechanics of the game. You never just walk up and press a button. You have to perform some maneuver or interact with the environment in some way. You can modify the environment in Lemma through several different systems that work together. The first allows you to extend an existing wall or platform by running off the edge of it. Keep running as if the wall does not end, and the game fills in the gap for you. Walls and platforms can be extended. You can activate the second system any time you're in the air. The game predicts where you're going, enters a "slow motion" mode, and offers several structures which you can use to maintain your momentum. They're transparent until you touch them; perform any parkour move on a structure and it becomes real. The world of Lemma is built from a variety of voxel materials with different interactive properties. 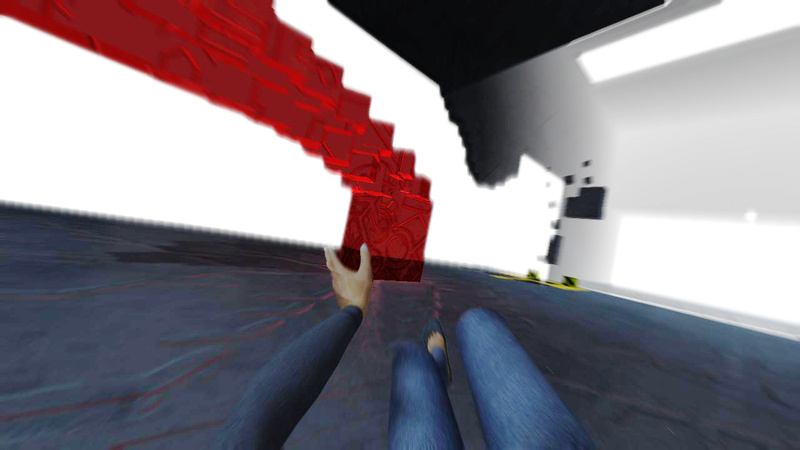 Red voxels hurt you, and they can infect white voxels. Blue voxels prevent the red from spreading, and also transmit power from contiguous power sources. Orange voxels implode when touched. In general, darker voxels are tougher. You can kick or roll through the brighter materials, and an explosion can destroy the medium grey materials, but dark materials are indestructible. Every voxel is fully physics-enabled. These aren't Minecraft voxels where you can knock out the base of a tree and the upper branches just float in the air. Some levels require you to strategically destroy supports holding up sections of the level. 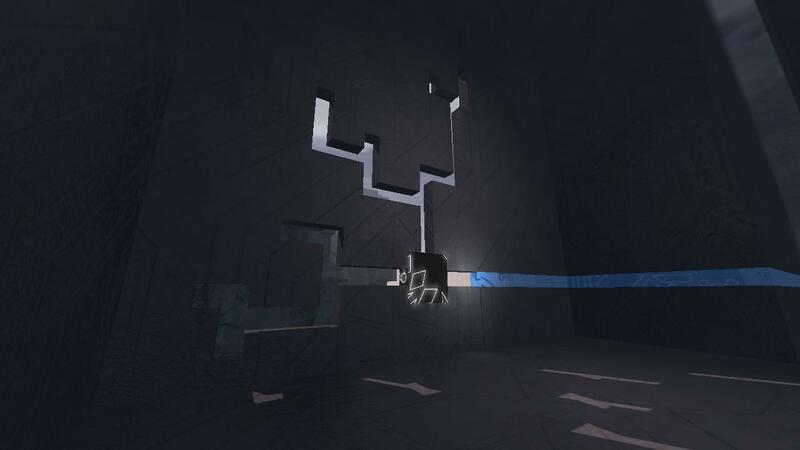 Lemma is an exploration game; you explore and piece together the story, and of course you do a lot of parkour. You play as Joan Emerson, a physics grad student whose colleague Mark hits a breakthrough and disappears into the mysterious world of Lemma. And she wants in on the action. Your choices impact the story outcome. 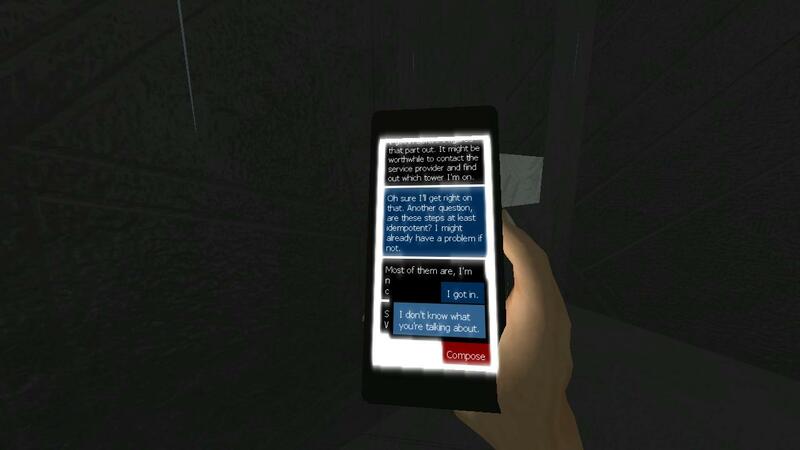 You interact with the branching storyline by exchanging text messages with your colleague. It should take around three hours to beat the game on the first try (sorry, no multiplayer!) While it's not an open world game, you will have some freedom to choose which levels to complete first. Lemma consists of a series of interconnected worlds linked by portals; some portals lead you back to places you've already visited, and the choices you make in one world can have unforeseen impact on other worlds. In your quest to discover the secrets of Lemma, you'll activate each world in a different way. You may have to blast through a wall, connect a power source, or build a bridge. Some worlds require you to simply get from point A to point B, while others require you to solve simple puzzles involving motion and the physics of the world while avoiding dangerous obstacles. In Lemma, the environment is alive. Sometimes it's on your side, while other times it's actively trying to kill you. You'll face a number of challenging enemies without weapons or martial arts experience. Your only defense is the ability to smash through certain materials. 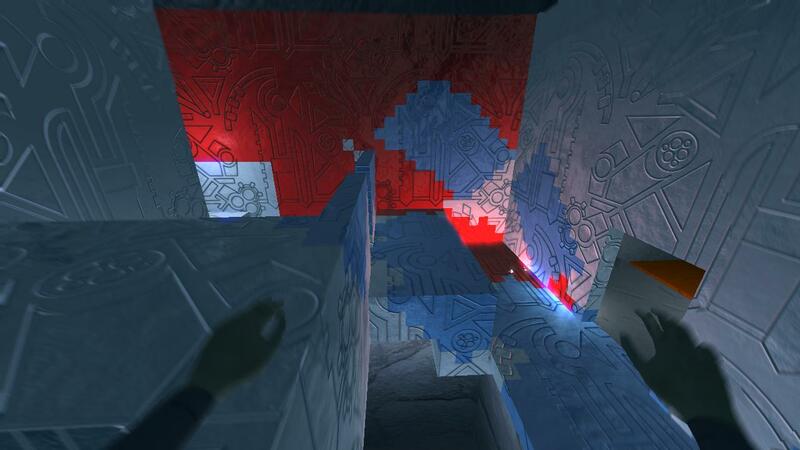 At points the environment actively, malevolently fills with impassible red blocks, forcing you to counter with safe blue blocks. Blue blocks prevent the red from spreading. The turret fires deadly explosive rounds that blast through structures which are normally indestructible to you. You must either sneak past it, outrun its fire, or leverage it for your own benefit. Every where you go, the environment in Lemma reacts to your presence. 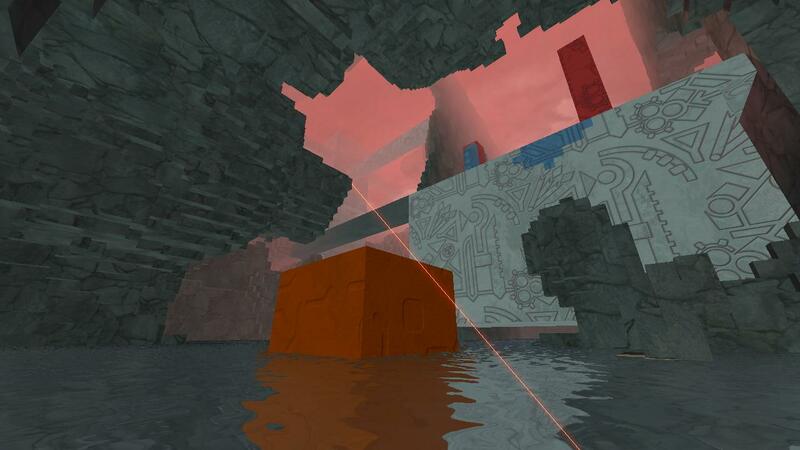 Towers of seemingly inert red blocks suddenly detach and fly at you. Some structures are not what they seem. Other enemies take advantage of the environment's fragile, changing nature to attack you. They will rip structures apart to get to you. Still confused about how exactly you can create things in Lemma? Skip to 2:15 in the video below for a detailed explanation. Yes, the 360 controller is fully supported! Why is the player a girl? The engine and many of the assets in Lemma are completely open source. You can download the source right now and create your own campaign. The game is designed to be extremely mod-friendly; it includes a scripting system and a rough level editor. What exactly is a lemma? In math, a lemma is a theorem or proposition used as a stepping stone to a larger result. What does that have to do with the game? Something about first-person single player games really inspires me. And there are already tons of third-person parkour games. Go play Assassin's Creed, it's quite good! That is a tricky question. It really depends on your definition of ludonarrative dissonance. $10,000 - Minimum funding to get the game out the door. $16,500: Mac / Linux / Steam OS port - I'll be able to devote time to port the game to these platforms. $20,000: Level Editor / Time Trial mode - The game already has a level editor, but it's not very user-friendly. This stretch goal would allow me to clean it up and include a time-trial mode where players could build custom maps, share them, and race against each other. Hi, I'm Evan Todd. I'm an independent game developer based in Columbus, Ohio. I started work on Lemma in 2010 while attending university. The project originally began as a way to raise money for charity. I graduated in 2012 and worked for a small iPhone game studio for a year, continuing to develop Lemma part-time. Finally realizing Lemma would never survive as a side project, I quit to focus on it full-time. I have enough saved up to live while I finish the game, but I need to hire an artist and composer to fill in the gaps in my skillset. My work on the player model and animations has been passable so far, but it's nothing compared to what a professional can do. The main challenge is the temptation to add more to the game. If I can keep focused and resist the urge to increase the scope, the game will release on time. I have a production schedule laid out to prevent that from happening. Otherwise I don't foresee any major issues. I work from my home office and I've eliminated most of my commitments, so unless I get hit by a bus, development will go on! EARLY BIRD - Get the game at a steep discount, as a thank you for supporting Lemma early on! All the above, plus a beautiful 24x36" poster. All the above, plus a hand-written letter of thanks, your name will be listed separately at the top of the credits, and I will also Skype or drive up to 3 hours from Columbus, OH to meet and talk about Lemma, indie games, or whatever you want! All the above, plus I will keep in contact over Skype and consistently ask your opinion on the game's design. You will be listed in the credits as an associate game designer.